Tune Store Spring Sale and Nail Art! 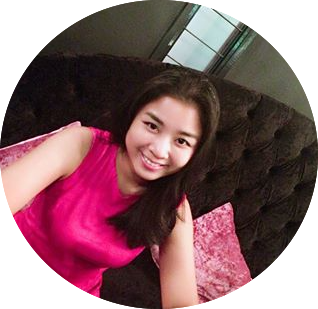 It's now on! I just got an sms from Tune Store today, it's gonna be from 28 Feb 09(today) till 5th April 09! It's only 1 month ++! Enjoy great discounts and special prices at Household Fair, 1st floor. Don't miss it! 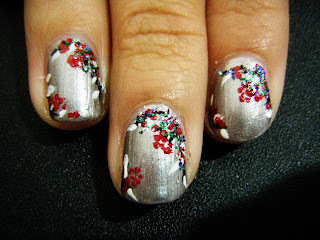 Well i had been doing nail arts since monday till thursday. So i decide to show you all my work.. =) enjoy! For those of you who doesn't know where it is, it's in 1 Borneo! The right side of it from the main entrance! 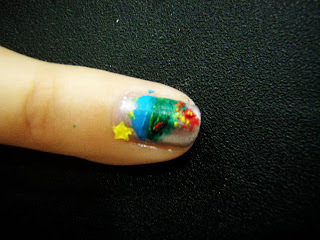 This was my 1st work in nail art (gosh!). I didn't add that black thingy, all was white before, Ms Mary (the lecturer for the course, assisted by her apprentices) added the others. She said it would be nicer. We just used nail colour and stickers for this session. The next day, we did a batik theme in the morning. 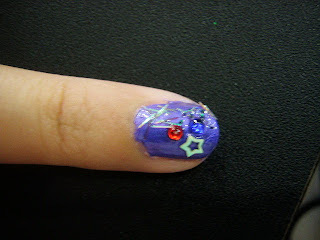 With purple colour with various tones. We used the thin, small brush and the two-sided brush (big and small dots). 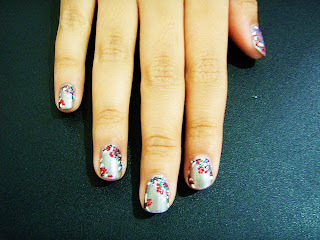 This is Sakura theme (well this wasn't a sakura -Diana & Denise said, more like morning glory. But it's nice still) I like the colours used! This is one of my fav too! The Bamboo theme! I used the brush and two-sided stick with green, yellow, white and some glitters on the leaves of the bamboo tree. Next was the last task, do anything we liked and i did a 5 different work (5 nails only, didn't have time) on my friend's hand. This one was a Boy and Girl in Love. I did it with the two-sided stick and some glitter. Then i did this, Love is in The Air. I used a heart sticker and placed small dots with small, thin strokes (yellow lines). After that is this. I drew mountains and grass with small red and green dots at the base to make it nicer. I put a star sticker at the upper left of the nail for the Sun. 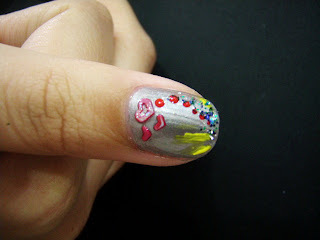 This one I used small yellow dots with one bling in the middle. 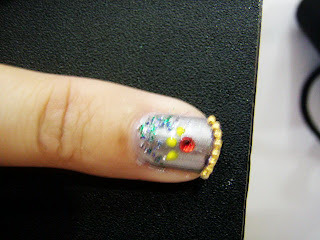 Then i lined small row of gold beads at the free edge and some glitter on top of the nail. Last but not least, was Bang! ! I call it bang because my model said it looked like this balloon that pops and out come all the stars and glitters! (if you see it from the base of the nail as the bottom). Soft Toys on Promotion in Popular! Amway Exhibition in 1 Borneo, KK. Called in Sick. Clinic Review.